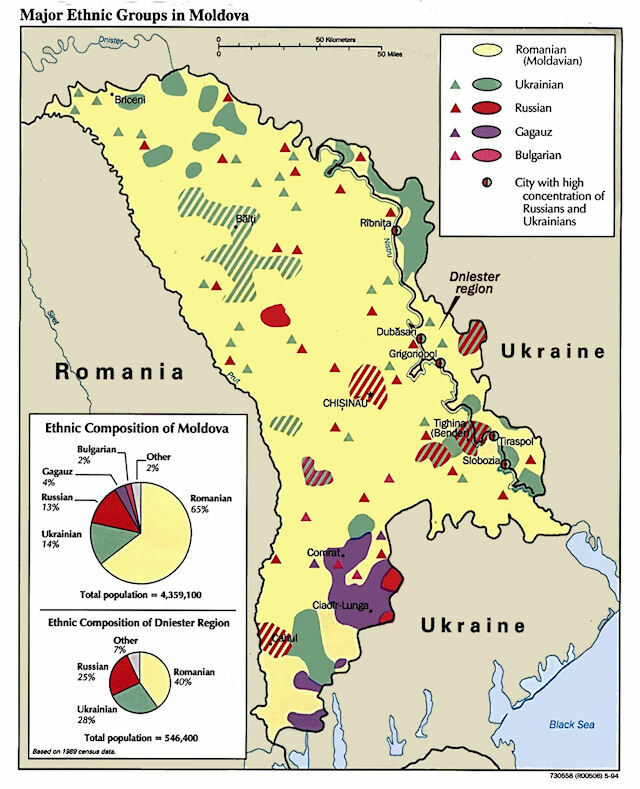 Moldovans are ethnic Romanians, with distinct regional character, an accented version of the Romanian language. The absence of a credible military capability is a specific concern in countries with under-developed or immature economic systems, such as Moldova. Wedged between Romania and Ukraine, it achieved its independence from the Soviet Union in August 1991. Moldova's economic outlook is clouded by a lack of manufacturing and energy resources, and the existence of Russian forces on Moldovan territory east of the Dniester River, the self-proclaimed "Transnistria" republic. The Republic of Moldova occupies most of what has been known as Bessarabia. The very existence of Bessarabia was, until the 20th Century, unknown except to a few specialists. The same good people who used to believe that the Ukraine was a musical instrument imported from Hawaii, and that both Gallipoli and Galicia were in Spain, thought, when they saw the name Bessarabia in print, that it was part of Arabia. These economic and political realities resulted in Moldova's Parliament debating in late 2007 the necessity for the continued existence of a Moldovan Army. Nearly two decades after the Republic of Moldova proclaimed its sovereignty, there were plenty of politicians of different political colour, from one end of the political spectrum to another, claiming that Moldova did not need an army, given its tendency to be a neutral state. The military security of the Republic of Moldova is ensured by the Armed Forces of the country comprising: 1) the National Army; 2) Border Guard Troops; and 3) Carabineer Troops. Only the first of these formations have significant combat potential, the later two have only a handful of armored personnel carriers. Forces of the national defence system are based on the principle of defensive sufficiency. According to the Law on national defence, during the times of peace and war, the command of Armed Forces is performed by the Supreme Command of Armed Forces chaired by the President of the Republic of Moldova, who is the chief-commander. The Supreme Command includes also the Minister of Defence, Chief of Command of the National Army, Commander of the Border Guard Troops and Commander of the Carabineer Troops. The absence of a sound economic base impacts heavily on any transformation efforts undertaken by the Moldovan Armed Forces. In assessing their vulnerable security situation the Moldovan Ministry of Defense (MOD) is focused on establishing closer relationships with the EU and NATO. A boost in this effort would be the transformation of the National Army into a lighter, deployable force capable of NATO support operations. Moldova's image in the world has not yet been well defined, but the Republic of Moldova is placed among other mediocre countries, without big perspectives. Compared to the majority of neighboring countries from the region, Moldova is in the position of a stagnant, obscure and irresolute country. A specially important role on the country image is played by the Transnistrian conflict. This partially frozen conflict creates an image of Moldova, as a weak, vulnerable and uncertain state. Moldovans view the development of their country with mixed emotions. Poverty, corruption and emigration are widespread. The pro-European political elite cannot manage to provide political stability. In the year 2015-2016, five prime ministers had been replaced; the country is at risk of suffocating in the oligarchs' stranglehold. To add to it all, there is the frozen conflict in the pro-Russian, separatist region of Transnistria, which seems insoluble despite OSCE negotiations. One consequence was a new wave of emigration by young and well-educated workers who no longer saw a future in their country. 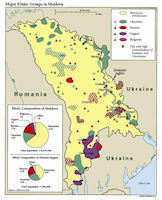 At the end of the 1980s, around 4.5 million people lived in the Republic of Moldova. By mid-2016, according to the national statistical office, there are less than 3.5 million people living in the country. Moldova has one of the world's fastest shrinking populations.